Getting a home loan will be one of the most important financial decisions of your life. Buying a home can mean so much for a family from stability to an investment. Unfortunately, if you have bad credit, that decision may seem like its already been made for you. Getting any type of loan can be tough to do with bad credit but convincing a bank to put down hundreds of thousands of dollars can be nearly impossible. Most people with bad credit just give up after a few rejections and figure they’ll never be able to buy a home. But there are things you can do to improve your chances of getting a home loan on bad credit. The six tips below won’t guarantee your loan approval but they’ll help to improve your credit and make your case to the bank. Should I even Be Buying a Home with Bad Credit? There are a lot of people that will say buying a home isn’t a good investment, whether you have bad credit or not. The argument is that the return on owning your home compared to renting isn’t so great after you pay taxes, home repair and other costs of home ownership. A lot of people got burnt in the housing bubble and easy home loans so there are plenty of bitter borrowers to spread the anti-ownership mantra. Don’t listen to them. Buying a home is a great idea and a smart move for people with bad credit. First, a mortgage is a forced savings plan in the equity you build up as your loan is paid. If you’ve got bad credit, there’s a good chance you haven’t been saving as much as you should for retirement. Adding a monthly mortgage payment won’t add that much beyond what you’re already paying in rent and you’ll have a built-in retirement fund. Just make sure you don’t refinance every few years and waste the money. Buying a home is also a good investment. The naysayers like to point to slow home price appreciation, about 4.2% according to Zillow, which is well below the 7.6% average annual return on stocks. In fact, that annual home value increase is closer to what you’d make on investing in bonds. The problem with this is that it ignores horrible investor behaviors that constantly lose money and under-perform the market. The average investor earned an annual return of just 2.6% over the decade to 2013 because they can’t keep from buying and selling at exactly the wrong time. That 4.2% home price appreciation is starting to look pretty nice, no? 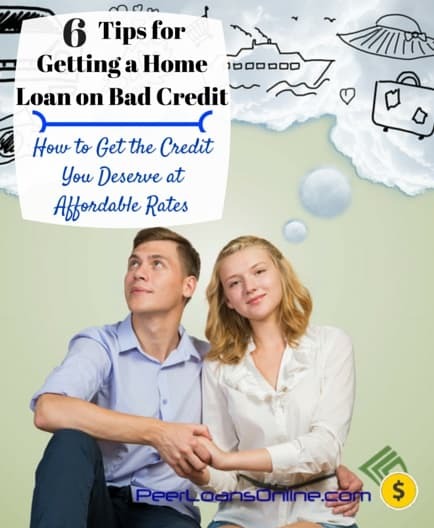 Buying a home makes even more sense if you have bad credit. Those monthly mortgage payments help build your credit history and credit scorers like that kind of non-revolving debt compared to revolving credit card debt. 1) As much as you want to rush out to buy a home, your best bet is to take some time if you’ve got poor credit. You’ll first want to work on your credit score, for at least three to six months if possible. We mapped out 21 steps to fix your credit score in a post on PeerFinance101, six of which I used to add 140 points to my credit score. The goal is to get your credit above 660 FICO which is considered ‘prime’ for most borrowers. You’ll notice a huge difference in the interest rates offered and loan officers will stop rolling their eyes when you walk in the door. If your bad credit is below 640 FICO, you might consider a debt consolidation loan to pay off credit card debt and start increasing your score. Apply for a three-year personal loan from a lender like Avant Credit to pay off higher interest rate debt. The loan works much like a home mortgage in helping to improve your credit score because it goes on your credit report as non-revolving debt and you’ll start racking up those monthly payments. 2) A down payment is even more important when buying a home with bad credit. You can pay as little as 3% down with some home programs but start saving now and aim for 20% down so you don’t have to pay mortgage protection insurance. One trick here, if you really want to call it that, is to think about the price of the home you want to buy as well as saving for a down payment. For example, a lot of people see that dream home for $300,000 and then wonder how the H$LL they’re going to save $60,000 for a 20% down payment. Looking at a few reasonably-priced homes, say for $200,000 means that 20% down becomes a more manageable $40,000 payment. The average family stays in a home for less than 10 years so focus on buying only as much home as you need now. 3) Get your financial documents in order before going to the loan officer. You’ll usually need your last two pay stubs, W-2 forms, last two years of tax returns and any bank or brokerage statements to verify your assets. 4) Getting a pre-qualification letter will not only help in the home buying process when negotiating with sellers but will also help you find a house within your budget. A word of warning here, just because the bank will give you a loan up to a certain amount doesn’t mean you need to buy a home worth that much. I would compare it to the speed limit but most people exceed that as well, often with horrible consequences. Just remember, the loan amount for which the bank approves is the maximum but not necessarily how much you NEED to borrow. One place you’ll definitely want to check for mortgage interest rates is USAA . Most people think that you have to be in the military to use their services but it’s actually open to everyone. I’ve had an account since I was in the Marine Corps but have cousins that have accounts and they have never been service members. 5) Make sure you understand your loan options when buying a home with bad credit. The big choices are 30-year versus 15-year and fixed versus adjustable rates. Payments on a 30-year loan will be lower but you’ll pay more interest. Go with a 15-year loan if you’re absolutely sure you can make the payments but don’t overextend yourself. Adjustable rate mortgage loans start at a lower rate and then increase in five years. Your payments will be lower at first but you’ll usually pay more in interest over the long-run and the interest rate increase in five years can be more than you can manage. I would normally come out against adjustable rate loans but they may be a better choice for someone with bad credit. If you stick to your monthly payments and don’t hurt your credit by missing payments on other debt, your credit score is going to be much better in five years. You may be able to lower your interest rate considerably by refinancing but only refinance for the loan amount, don’t take any cash out of your equity. 6) Don’t do anything to ruin your credit during the home loan process. Keep up with all your debt payments and don’t apply for any new credit cards. Don’t close any credit cards either because this can actually hurt your credit score for a few months. You shouldn’t be locked out of the benefits of buying a home just because you have bad credit. Learn how to use debt as a tool for financial leverage and to meet your financial goals. Buying a home with bad credit doesn’t have to be a costly or complicated process, just follow these six steps to get the loan you deserve.